Week #13 of 48 Weeks of Historical Craftivism, Jim Simpson's POW Rug! - craftivism. Week #13 of 48 Weeks of Historical Craftivism, Jim Simpson’s POW Rug! By Betsy on June 5, 2014 in #HistCraftivism, knitting. So what has happened here the past few weeks?! The website was updated so that now I can run it off of WordPress instead of other means! Woohoo! Although I still can’t get the text to show it in blue, all the text below is from other sources and linked back to them. Therefore, let’s continue where we were, shall we? 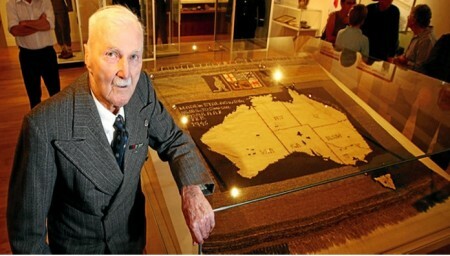 This week, I’m highlighting Jim Simpson’s knitted rug that he made in POW camp in WWII. Although I wrote about Jim in 2008, which you can see here, I wanted to include him in #HistCraftivism because what he made is an amazing testament to our will to create during times of distress. “I knitted a few pairs of socks for some who were eager to escape, but they all seemed to return rather crestfallen, but with socks intact.” J.O. Simpson, 1995. 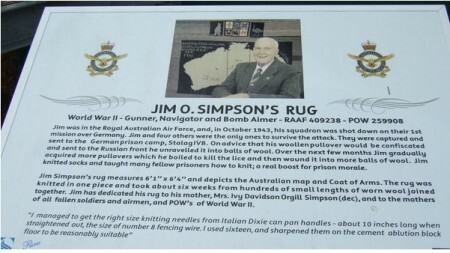 James O. Simpson enlisted in the Royal Australian Air Force in 1940, aged 26. 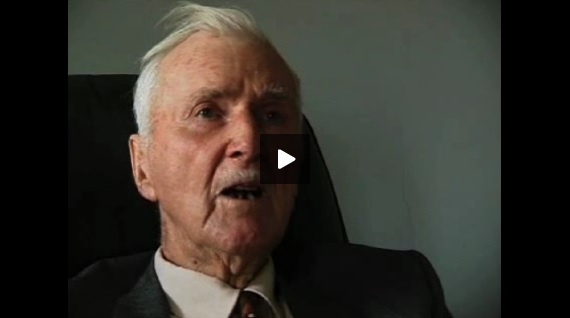 On his first mission, his aircraft was shot down. Captured by the German Army, he was transported to a prisoner of war camp, where he spent the rest of World War II. 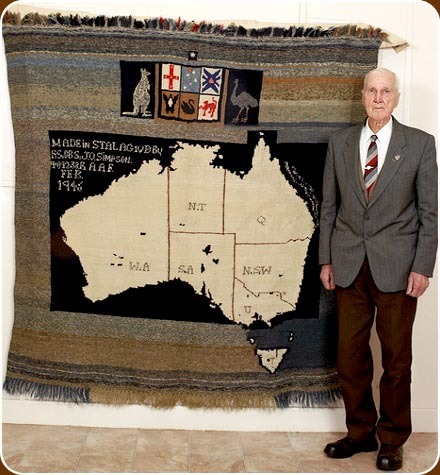 As a prisoner James knitted an extraordinary memorial to this time in Australia’s military history: a rug depicting a map of Australia and the Coat of Arms. They wanted to send it to the Russian front, I said they can’t do that… so I went to the toilet and pulled it to bits, and if they wanted it they could put it together again. The rug itself was knitted in one piece, the Coat of Arms and all. The Crown Jewels were worked with a needle and coloured wool, five crowns for the Cross of St George for NSW’s, one crown for Victoria’s Southern Cross, and one crown in the centre of the Maltese cross for QLD. Afraid that his new wool Naval pullover would be stolen by the prison-camp guards, Jim unraveled the sweater, rolled the white yarn into balls, and stored them away in Red Cross boxes. Everyone thought he was crazy, wondering “what the hell he had all that stuff for. They crafted knitting needles out of their dixie pan handles. They unravelled socks and had to boil the wool to get the lice off it and then spin it into 12 ply. It’s a complete map of Australia with all the states marked, all the mountains and the rivers and lakes. He’s got a coat of arms for each of the states above the map. The whole thing is a six-foot square rug. It’s in fantastic condition. It was used for a little while then rolled up and moth-balled so from a conservation point of view it’s been very well looked after. Earlier this year  Jim Simpson’s bed caught fire. Which was all wonderful until his electric blanket caught fire. Act #14 of 48 Acts of Historical Craftivism, Alexis Casdagli’s F*ck Hitler Cross Stitch! 4 Responses to Week #13 of 48 Weeks of Historical Craftivism, Jim Simpson’s POW Rug! Great story. Inspiring. Thank you for sharing!